The sentiment (from the Needle & Thread stamp set) was heat-embossed on Crumb Cake Cardstock, using a Versamark Pad and White Stampin’ Emboss Powder. After cutting out the sentiment, I popped it up with a few Stampin’ Dimensionals. Tucked underneath is a bit of ribbon (from the SAB Organdy Ribbon Combo Pack), some of the Braided Linen Trim, and a small strip of the Botanical Butterfly Designer Series Paper. 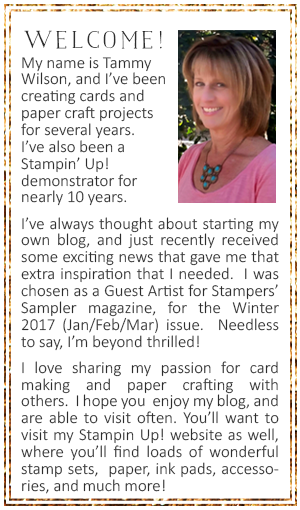 through the slots, and popped it up with a few Stampin’ Dimensionals. For my last few details, I also sprinkled in a couple of Basic Adhesive-Backed Sequins and a Faceted Dot.